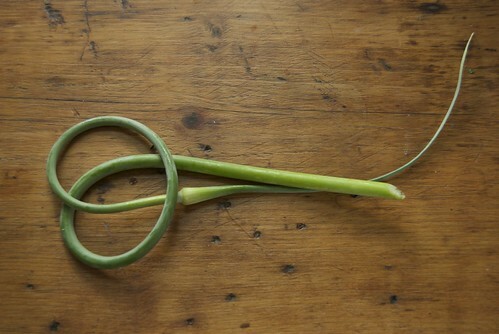 Have you tried garlic scapes? They sprout out of the stem of hard-neck varieties of garlic curling into an illegible alphabet of stems. In the northern United States, garlic is planted in the fall and begins to sprout in the early spring. Sometime in June the scapes shoot up. Eventually this stem will blossom in the garlic’s “flower” and produce tiny little bulblets of garlic. These can be planted and will grow into small garlic plants, but usually individual garlic cloves are planted to become next year’s crop. Back to these scapes. They are sweet and garlicky and easy to snap off the stem. Harvesting the scapes helps the garlic plant focus on growing a larger bulb instead of producing a flower. At the CSA where I work we spent a whole morning picking the scapes off the garlic plants. Since then, all of the members have been taking home handfuls of these twisted green stems each week. When the scapes are cooked, their flavor becomes less spicy but still pleasantly garlicky and sweeter than the flavor of a clove. I recently picked up a copy of Put Em Up by Sherrie Brooks Vinton which is a fun and informative book about different preserving techniques and recipes. One of the sections that convinced me I needed the book was the chapter of recipes for ramps and scapes. I had more scapes than I could imagine using soon and was glad to try Sherrie’s recipe for garlic scapes in oil. 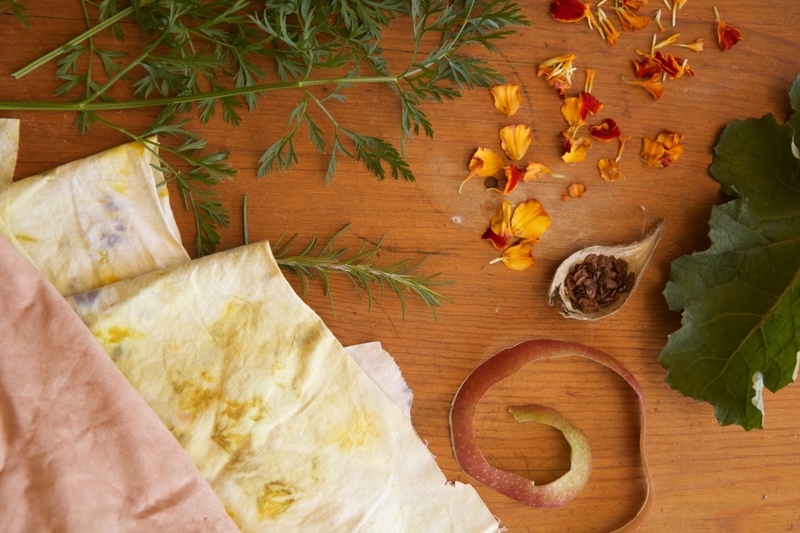 For me, preserving food is part obsession, part experiment. Each year I try new things that I haven’t frozen, canned or fermented before. Scapes are only available for a short part of the season which is a good reason to enjoy them while they last. If, however, you have more than enough and want to make them last even longer this recipe is a fast way to keep garlic scapes in the freezer to throw in future soups, stir fries, or scrambled eggs. If you are freezing the scapes, you can spoon the cooked into ice cube trays to create small blocks of frozen scapes (once they are frozen, transfer to an airtight container). I usually put the scapes into a large plastic freezer bag and flatten the scapes into a thin layer. It is easy to break off the amount that I need this way, too. Place a skillet over medium heat. 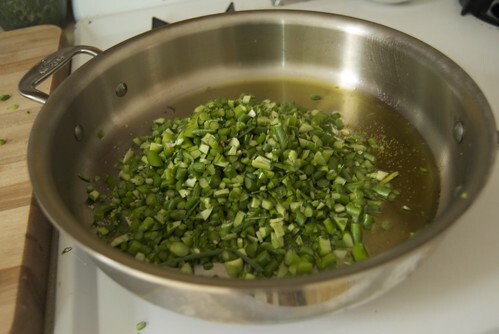 Add the oil to the skillet and once the pan is hot, pour in the the scapes. Saute over medium heat, stirring occasionally, for about 5 minutes or until the scapes are cooked but not too soft. Remove from heat and let cool. Store in the fridge for a few days or freeze for several months. I had no opportunity to find garlic scrapes this summer, hopefully I will find them or plant them next summer. In my future plans is to try "Pickled Garlic Scrapes" . 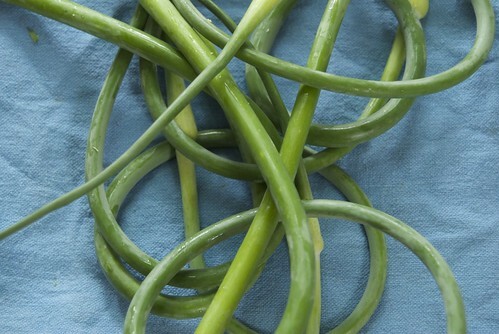 Apseed – Pickled garlic scapes sound interesting, too! 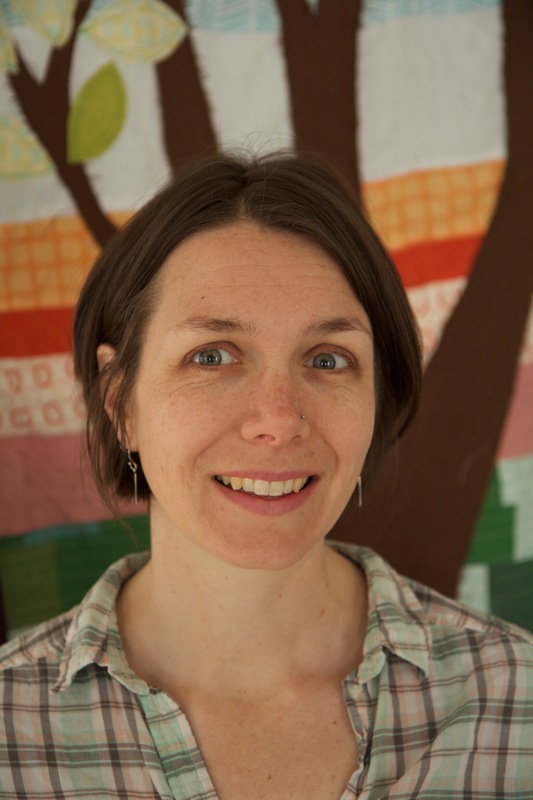 TGL – I hope your garlic grows well! I've made pesto with garlic scapes and it's mighty yummy… I froze it with great success if you ever want to try that.